Share Our Strength is a great organization work to help child hunger. Between last weekend and this coming weekend there are going to be bakesales across the country as part of the Great American Bakesale. Check to see if there is one near you, hopefully you didn’t miss it! DC Food Bloggers Bake Sale for Share Our Strength and No Kid Hungry. I baked Mexican Chocolate Chewies from theHomesick Texan cookbook. I got the book from the library and love it. This is the 3rd recipe I have made from it and they have all been great, I think I may need to buy a copy. The “Chewies” are really more like meringues, with lots of nuts and chocolate in them, which is a great addition. Since there is no flour, I am pretty sure they are gluten free, the are definitely delicious. I couldn’t find the Chipotle powder the recipe calls for so I just copped up a couple of dried chipotles I got from Safeway. A minced chipotle from a can would work too. Anyhow, stop by the bakesale and buy my cookies! Or some other tasty treats! Or visit your local “Bakesale” Or just a make a donation online, you don’t get cookies but you will be helping a great cause! While oven is heating, arrange the chopped pecans in a skillet and place in the oven for 5 minutes or until theyâ€™ve turned a bit darker brown (but not black) and smell fragrant. Mix roasted pecans with the powdered sugar, cocoa powder, cinnamon, chipotle chile powder and salt. Stir the egg whites into the dry mixture by hand (or beat with a stand mixer on low) just until the batter is well mixed. Stir in the vanilla and chocolate chips. Drop tablespoon-size portions of batter on the sheet an inch apart, about six per sheet, as these cookies will spread during baking. Bake for 15 minutes or until crackling on the surface. Remove sheet from the oven, lift the parchment paper with the cookies still on it off the sheet, and cool on a rack. 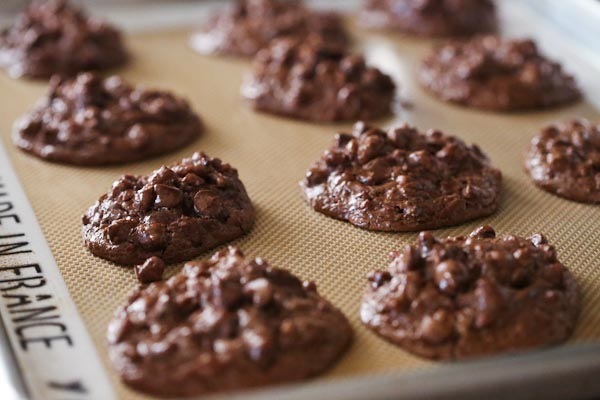 Allow cookies to cool for 20 minutes before removing from paper, as theyâ€™re very delicate. They will keep for a few days in an airtight container. These cookies look delicious! I love chocolate and cinnamon together!